During the worst of it last year, right after his beloved Grandma Emmi died, Peter would sometimes say he felt like Job. Would the terrible things never stop? Today, I feel like Job after the pestilence and loss. Just tonight, three wonderful things happened. First, we raised over $700 for Hope for Two. I was and am humbled and speechless by the generosity of people for this small organization that makes a big difference. This money will go to help support the people who connect newly diagnosed pregnant women with support women who had the same kind of cancer. It will go to pay postage to mail information to those women, including articles about cancer during pregnancy. Maybe it will help them reach out to more physicians, to make them aware of their services when the worst happens to their patients. Those letters, phone calls and moments of contact truly can mean the difference between the endless dark of fear and faint hope of a new dawn. Thank you for making these small miracles possible. Second, exciting things may be on the horizon on the house front. Stay tuned and send good vibes that the universe works out in the way that it should, whatever that is. 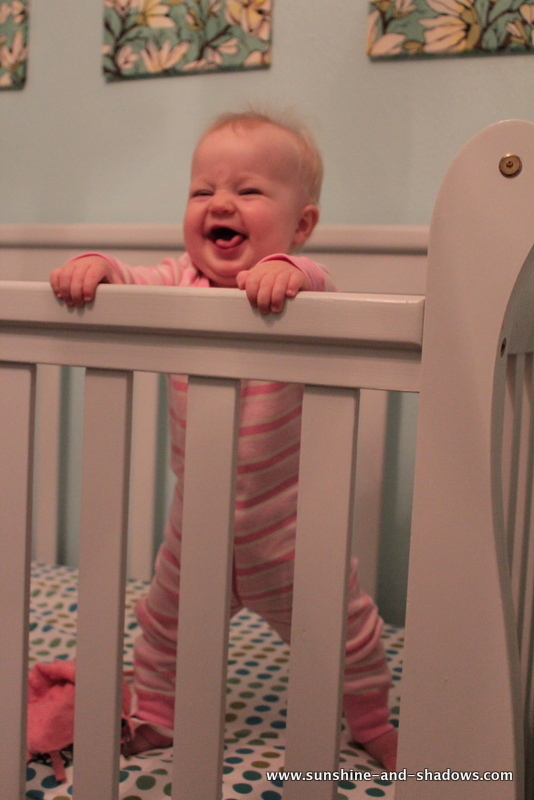 Third, a certain small resident of this household discovered she could pull herself to standing while in her crib. You have never seen a prouder face than hers when she pulled herself up for us: While she was showing off this new skill, she seemed to be talking quite a bit. Peter was joking around and said, “Say ‘Dada. '” And what do you think came out of her mouth next? “Dada,” clear as day. I think both our hearts stopped. Such an incredible moment. Even thought it was 11 at night, we just sat there, watching her pull herself up over and over, watched her take her first tentative little steps (while hanging on for dear life), and listened to her laughing hysterically with joy. So (she said cautiously, looking over her shoulder), it seems like (maybe) the dog days really ARE over, and perhaps now we are reaping the blessings of life, that are all the sweeter for our sorrows. Thank you for sharing every moment with us, good and bad. We wouldn’t be here without you. 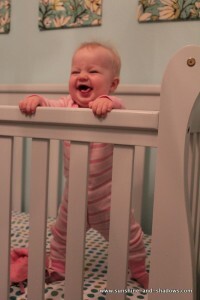 I LOVE her expression as she pulls herself up!! Fantastic! I can't believe Gianna is cruising already! I guess we'll be there in a couple weeks ourselves. It's SUCH a cliche, but seriously, how fast is this going??? Great post Shannon! Happy to hear much happier news from your neck of the woods. More than well deserved. Enjoy!